Do you dread certain holidays? I’ve had a love/hate relationship with many holidays, dating back to childhood. Holidays involve family gatherings, and when family comes together, it often brings out the worst in people. For much of my adult life holidays weren’t much better. Early on I realized I had married into a family where competition rose to blood sport levels. Half my husband’s relatives constantly had to prove they were better, smarter, or more accomplished than anyone else. The other half wanted nothing to do with us, thanks to my communist mother-in-law. I think I probably would have liked them, given how my mother-in-law treated me, had I ever had the chance to meet and get to know them. However, there has been one upside to spending time with all these bullies. They’ve given me a wealth of ideas for both characters and plots in my books. When people take pleasure in making your life miserable, rather than getting mad, it’s best to get even. Writers do this by putting these people in their books. Just in case you're wondering, my mother-in-law died before I published the first Anastasia Pollack Crafting Mystery featuring Anastasia's nasty commie mother-in-law. And in other books, names and various details have been changed. I know who inspired that antagonist, but you'll never know. Still, it's very cathartic. So why am I telling you this today? It’s because Valentine’s Day is quickly approaching. It’s another holiday that many people anticipate with dread, especially anyone not currently in a loving relationship. Thea Chandler and Luke Bennett are two people who would cringe at the sight of all those heart-shaped chocolate boxes in store windows this time of year—as would Grace Wainwright and Beck Delaney. Thea and Luke are the hero and heroine of the award-winning romantic comedy Hooking Mr. Right. Grace is Thea’s editor. She and Beck, who both have their own reasons for hating Valentine’s Day, show up in the short story sequel Finding Mr. Right. Both the novel and the short story include recipes perfect for Valentine’s Day or any day. In this short story sequel to the award-winning Hooking Mr. 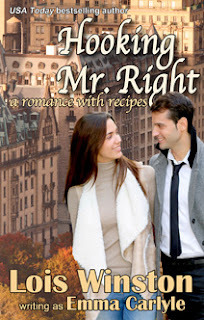 Right by Lois Winston (writing as Emma Carlyle,) editor Grace Wainwright, has taken over the role of bestselling author and romance guru Dr. Trulee Lovejoy. Thea Chandler, the original Trulee, is now married to her Mr. Right and is a successful cookbook author. She and Grace host the top-rated Love Recipes cooking show. When producer Becket Delaney announces the first two shows in February will have a Valentine’s Day theme, Grace freaks out. The worst day of her life occurred on Valentine’s Day ten years ago, and she wants no reminders of it. Beck has his own reasons for hating the holiday, but the show must go on, and he absolutely refuses to deal with an uncooperative prima donna. When a citywide blackout traps him and Grace in his thirty-fourth floor office, their adversarial relationship really begins to heat up.